I glanced over the nebula award nominees for this year to see if anything piqued my interest, and saw this one. Steampunk, set in a post apocalyptic setting – I was sold. It’s a circus of undead performers, enhanced with hollow bones for the acrobats to make them light as birds, a human trapeze, a strong man with a steel spine, and his brother saved from fever with mechanical lungs. Once there was a man with wings, like a bird, until he fell. I went into it not knowing what to expect, so I’m not sure what I expected. It’s very experimental, style wise (literary, some might say). The Steampunk is more a veneer over the top, an aesthetic choice, which I love. Genre wise, I would call it magic realism, because there is magic, but the way magic works is never explained, but used in more of a free-form way. The story made me think of Peter S. Beagle or Neil Gaiman. I don’t think I’ve read anything so subtly creepy since The Innkeeper’s Song. It’s about beauty and love and death, and the writing itself is beautiful too. I normally find things this experimental to be annoying, but I think that’s often because “literary” authors sometimes think that the writing is everything, and they don’t have to have a story to tell. Miss Valentine has a story to tell. She doesn’t tell it in chronological order, and the point of view is all over the place, running from first to third person and not skipping second person, and yet, the confusion at first didn’t bother me. It was obvious fairly quickly that it was told out of order. Also, I liked the scene openings she had sometimes, the ones that start with “This is what happens when (insert framing phrase to tell me where she’s jumping into the story. )” It was as unsubtle as a slap in the face, maybe, butso much less annoying than the author using dates to tell you when something’s taking place. I can’t stand that, I can’t keep track of the numbers in the dates, so they might as well not be there. This? This was effective and efficient. Overall, I loved it, it was beautiful. 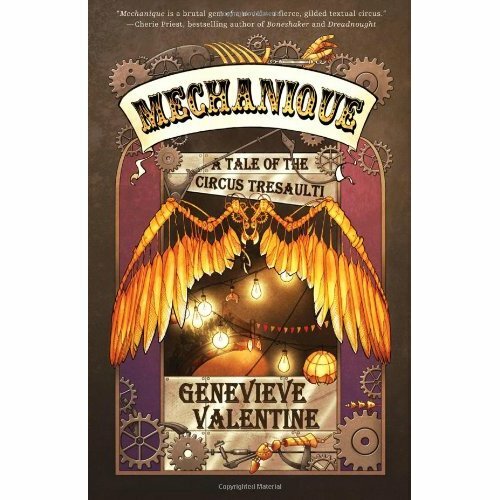 This entry was posted in Books, Reviews and tagged Book Reviews, books, genevieve valentine, magic realism, Mechanique, Mechanique: a tale of the circus tresaulti, nebula award nominee, steampunk. Bookmark the permalink.